2016 has been devastating. So many wonderful and talented people have passed away this year. FIDEL CASTRO IS NOT ONE OF THEM. 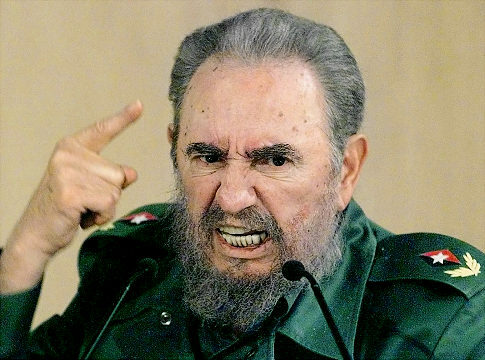 For all the leftists out there trying to rewrite history, Fidel Castro was a a brutal dictator who enslaved the people of Cuba with false promises of leveling the playing field with socialism. The only thing they got out of it was an equal share of poverty and misery. I am NOT writing this while wearing the rosy glasses of an American citizen, I'm writing this out of an awareness of the world around me. How many times do you have to hear about people risking life and limb by traveling oversea on makeshift rafts just to escape the horrid conditions of Cuba just for the chance at freedom, life, and liberty to make you a believer? ...like Castro did for over 50 years in Cuba. So the next time you praise Fidel in one sentence then are critical of the USA in the next, you might need a better understanding of the world. America isn't even close to perfect, but at least you won't go to jail for saying so.